Preet Bharara, U.S. Attorney for the Southern District of New York. 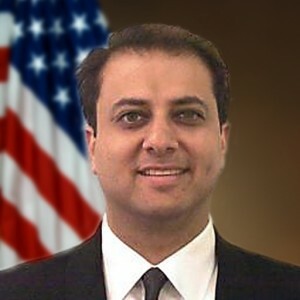 Atlanta, GA: Preet Bharara, the United States Attorney for the Southern District of New York, Thomas O’Donnell, the Special Agent-in-Charge of the New York Office of the U.S. Department of Health and Human Services, Office of Inspector General (“HHS-OIG”), and Steven G. Hughes, the Special Agent-in-Charge of the New York Office of the U.S. Secret Service recently announced charges against eight individuals, seven of them of Indian origin, for their alleged involvement in a lucrative scheme in which information technology vendors paid over $2.3 million in bribes and kickbacks to secure business from executives of a Manhattan-based medical cost management company (the “New York Company”), according to a press release posted on the Justice.gov website. The defendants charged with paying the bribes and kickbacks are Sarvesh Dharayan, Sanjay Gupta, Venkata Atluri, Rangarajan Kumar, Vadan Kumar Kopalle, and Darren Siriani. The defendants charged with receiving the bribes and kickbacks are Anil Singh and Keith Bush. Dharayan, Gupta, Koppalle, and Siriani were arrested at their homes in New Jersey, and were presented in Manhattan federal court before U.S. Magistrate Judge James L. Cott. Singh, who was previously arrested in April 2013, pled guilty to honest services fraud and other charges before U.S. District Judge Denise L. Cote on July 11, 2013. Bush, who was also arrested previously on July 12, 2013, is next scheduled to appear in court for a pretrial conference on August 15, 2013. Atluri and Kumar are not yet in custody. SINGH was employed as a Senior Vice President and the Chief Information Officer at the New York Company, which provided nation-wide medical cost management solutions including, among other things, medical reimbursement services, and Bush was employed as the company’s Director of Database Administration. Singh and Bush had considerable influence over the selection of vendors, specifically vendors of database administrators (“DBAs”), hired by the New York Company. Dharayan, the owner of a New Jersey information technology company (“Vendor 1”) and Gupta, an employee of Vendor 1, paid approximately $1,722,620 in kickbacks and bribes to Bush and Singh in exchange for receiving DBA business from the New York Company. From 2010 to 2012, the New York Company paid Vendor 1 approximately $6,625,479.20 for placing DBAs with the New York Company. Atluri, the owner of another New Jersey information technology company (“Vendor 2”), paid approximately $190,436.75 in kickbacks and bribes to BUSH and SINGH in exchange for receiving DBA business from the New York Company. From 2008 to 2012, the New York Company paid Vendor 2 approximately $11,495,804.88 for placing DBAs with the New York Company. Kumar paid approximately $247,634 in kickbacks and bribes to BUSH and SINGH in exchange for their agreement to steer DBA business to another New Jersey information technology company (“Vendor 3”). From 2009 to 2012, the New York Company paid Vendor 3 approximately $2,593,210.38 for placing DBAs with the New York Company. Kopalle, who was in charge of delivery and operations at a Texas information technology company (“Vendor 4”), paid approximately $142,967.50 in kickbacks and bribes to Bush and Singh in exchange for receiving DBA business from the New York Company. From 2009 to 2010, the New York Company paid Vendor 4 approximately $1,035,660 for placing DBAs with the New York Company. Siriani, the owner and operator of another New Jersey information technology company (“Vendor 5”) paid approximately $23,000 to $29,000 in cash kickbacks and bribes to Bush and Singh in exchange for receiving business from the New York Company. Siriani also paid for hotel rooms in Las Vegas and Costa Rica, deep sea fishing, massages, sports tickets, and other things, all in exchange for receiving business from the New York Company. From 2008 to 2012, the New York Company paid Vendor 5 approximately $1,177,600.91 for various services and products. According to the Complaint, Dharayan, Gupta, Atluri, Kumar, and Kopalle paid the kickbacks and bribes through conduit companies established by Bush and Singh for the very purpose of disguising the true nature and origin of the illegal payments. To further conceal the bribery and kickback scheme, Bush and Singh sent false invoices to the conduit companies for consulting services that never occurred. Many of the kickbacks and bribes were paid pursuant to these false invoices. Dharayan, 42, of Edison, New Jersey, Gupta, 38 of East Windsor, New Jersey, Atluri, 41, of Monmouth Junction, New Jersey, Kumar, 47, of Monroe, New Jersey, Kopalle, 43, of Edison, New Jersey, and Siriani, 45, of Matawan, New Jersey, were each charged with one count of conspiracy to commit honest services fraud, which carries a maximum term of 20 years in prison, one count of conspiracy to violate the Travel Act, which carries a maximum term of five years in prison, one count of honest services fraud, which carries a maximum term of 20 years in prison, and one count of violating the Travel Act, which carries a maximum term of five years in prison. Dharayan, Gupta, Atluri, Kumar, and Kopalle were also charged with one count of conspiracy to commit money laundering, which carries a maximum term of 20 years in prison. Singh, 40, a resident of East Brunswick, New Jersey pled guilty to one count each of conspiracy to commit honest services fraud, conspiracy to violate the Travel Act, honest services fraud, violating the Travel Act, and conspiracy to commit money laundering. He faces a maximum penalty of 70 years in prison on all counts. Bush, 41, a resident of Rahway, New Jersey, is charged with one count each of conspiracy to commit honest services fraud, conspiracy to violate the Travel Act, honest services fraud, violating the Travel Act, and conspiracy to commit money laundering. He also faces a maximum penalty of 70 years in prison if convicted on all counts. Bharara praised the outstanding efforts of HHS-OIG and the U.S. Secret Service in the investigation. He also thanked the New York Company for its assistance and cooperation in the investigation. This case is being handled by the Office’s Complex Frauds Unit. Assistant U.S. Attorney Jason P. Hernandez is in charge of the prosecution. Assistant U.S. Attorney Christine Magdo of the Office’s Asset Forfeiture Unit is responsible for the forfeiture aspects of the case.